Anyway, today I wanted to talk about the tattoos I want most, what it is I want them to look like and why they have meaning to me. I have a lot of tattoo concepts in the works and I can't wait to get my first. So let's talk about the one I plan on getting ASAP. 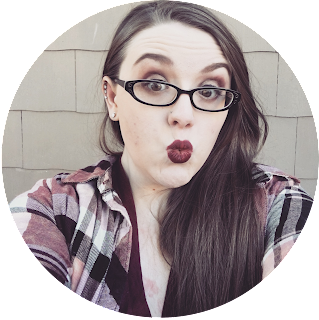 This year I started to share my struggles with mental health here on my little internet home. And something I've wanted to get for a long time is a tattoo to remind me that no matter how hard it gets my worst times are behind me. I never tried to commit suicide because I didn't want more pain I wanted it to stop. The idea of having to cut my arms just seemed like it would make it worse. But I used to cry myself to sleep wishing not to wake up. So when I heard about semicolon tattoos a couple of years ago I immediately wanted one. But I wasn't sure what I wanted. I didn't want a plain semicolon and I didn't really want just a word either. But last month I finally came up with an idea and fell in love with it when I started doodling it. Now I can't stop thinking about it and I need to get it ASAP. I decided I wanted something with rocks or mountains because I wanted to remember that my rock bottom is behind me. I also want something with a moon because I absolutely love the moon and stars. 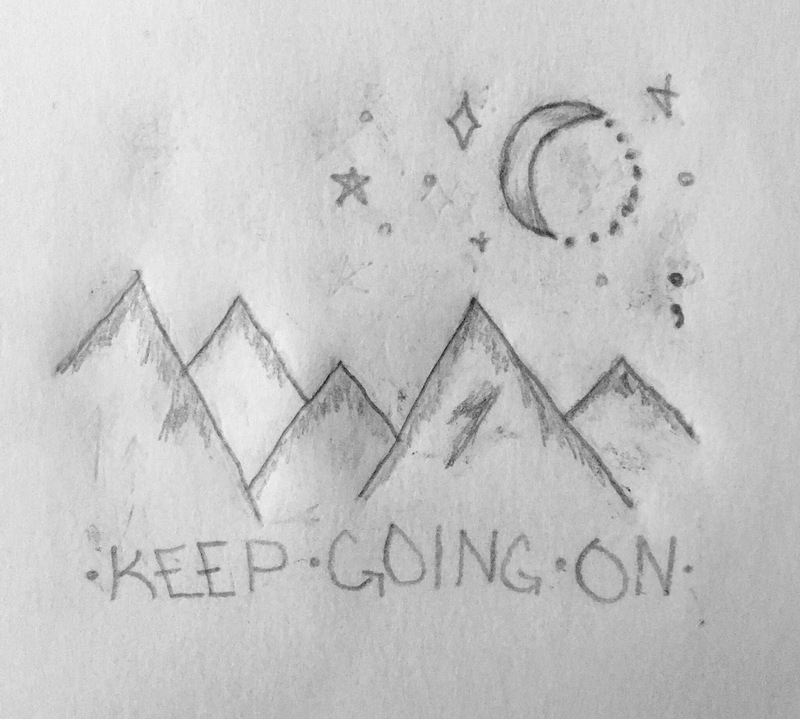 I still debated on putting the semicolon in a word so I decided to add KEEP GOING ON and having the semicolon in GO;NG but I didn't like it so I moved the semicolon to the sky as a star and have KEEP GOING ON under the mountains. This is my sketch of the design. The mountains and the font aren't 100% what I want but I'm hoping the artist can help with that. But I do what to keep that little Z looking mark to symbolize ZombieGoddess. I absolutely love the concept art! It's going to go on my left wrist so I can see it 24/7. 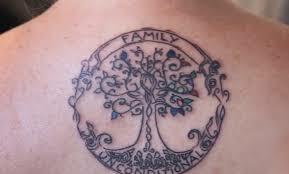 After that, I think I want to get a family tree tattoo on my right shoulder blade. I want to have something I can add to when I have kids. I've seen where people have the tree and put their kids' birthstone colours on the limbs. I really want to get it and add my niece and nephew. Then I can add to it as I have kids and if my sister has anymore. Something like this in structure with a vastly different design. My sister and I have talked about sister matching tattoos and just this week I've had the idea of coffee cups. We talk about coffee all the time and I think it would be a cute matchy tattoo. We could angle them and when we put them together they would look like they are cheersing. I love the idea and might dry something up this week. I want an SBux outline with some green somewhere but her's would probably be grey scale. But I still love the idea! I want mine on my right inner ankle. Something some people might think is stupid is that I want a collection of tattoos from my favourite movies and TV and games. So a Triforce on my right wrist because Zelda was my first video game. A decorated Deathly Hallows on my outer left forearm because I love HP. Also a, I solemnly swear I am up to no good on my right inner bicep and a mischief managed on my left inner bicep both with maroon watercolour and footprints just like the map. I'd also love to get a Slytherin tattoo of some kind but I haven't thought that one up yet. I also want a Tardis and some Gallifreyan. Maybe Doctor Who or some writing from the Tardis control room. Maybe get the Gallifreyan on my left middle finger and the Tardis on the back of my neck just under my hairline. And as stupid as it may sound I really want a vibrant Rick and Morty Piece too. Maybe on my right front thigh just above my knee. I also really want something for the Joker. Maybe a set of card suit outlines on my right middle finger. I'd also love a little silhouette of Dany's dragons from GOT. Maybe on my left collarbone. All these pieces would be pretty little. I don't want massive pieces. But I do want bold blacks and vivid colours. Geek pieces might seem stupid to some people but these stories had a big impact on me. I want to carry pieces of them with me. 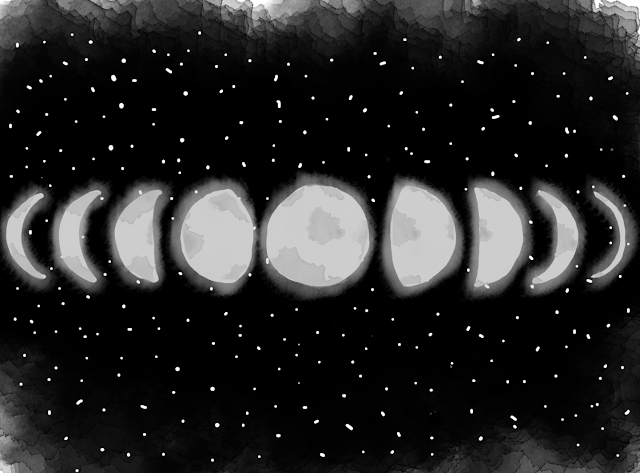 I'd also love a small lunar cycle outline on my outer right forearm. I just adore the moon and stars and things of that nature. And I think that is the end of my list. For now anyway. Tattoos are addictive and I haven't even started getting them yet. Anyway, I wrote this as a bit of a speed writ, spur of the moment thing so I hope it makes sense to someone. Do you have any tattoos? 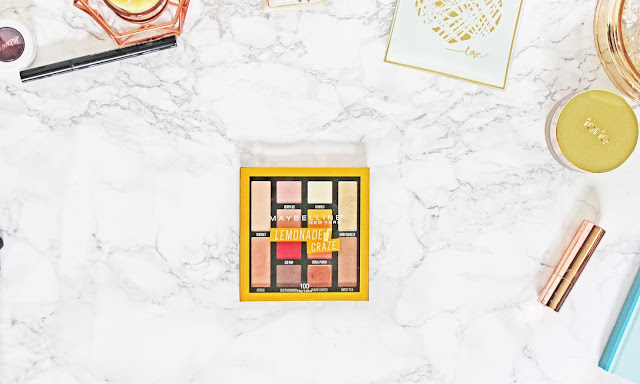 Or are you planning on getting some? Let me know what artwork you have/want on your body forever. Photo Credit: Photo is a piece of my artwork.